Sticks with ash handle, elm blade. Curved Stick. Glass-wrapped. 2-piece handle. 53 inches long. Shipping wt. 2 lbs. "Slap Shot" Stick. _Fiber glass wrap. 53 in. on back. 13 inches long. Jamaica. dirig. Protected thumb, cuff. Jamaica. 11-inch. For youths S to 14 years of age. 10-inch. For boys to S years of age. Practice Puck. (Not shown.) Soft rubber. and 8 ) Tubular aluminum frame. Nylon net. Unassembled. 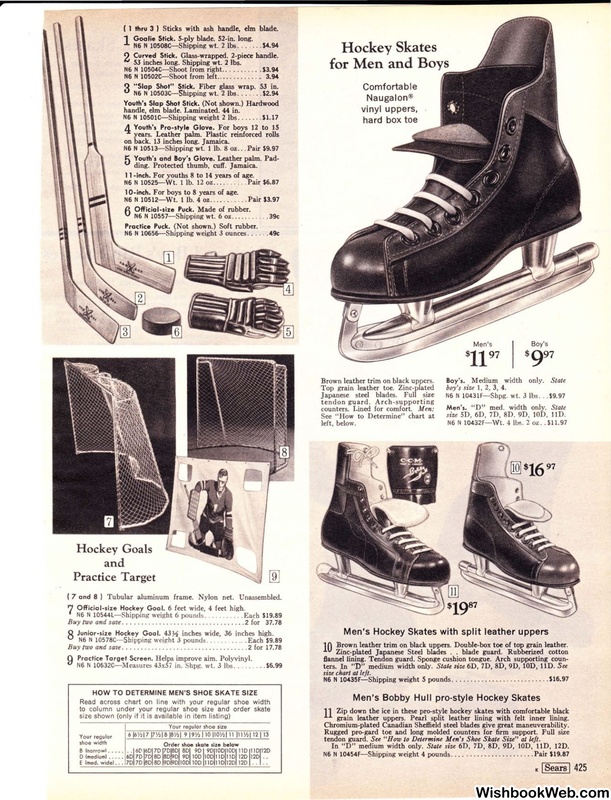 Officio I-size Hockey Goo I. 6 feet wide, 4 feet high. inches wide, 36 inches high. Practice Ta rget Screen. Helps improve aim. Polyvinyl. N6 N10632C-Measures 43x57 in. Shpg. D lmediuml . . ... 60 70 70 80 8090 90 100 100110110 120 120 . .
Brown leather trim on black uppers. Men's. "D" med. width only. 6D, 7D, SD. 9D, lOD. 1lD. Brown leather trim on black uppers. Double-box toe of top grain leather. grain leather uppers. Pearl split leather lining with felt inner lining. Chromium-plated Canadian Sheffield steel blades give great maneuverability. "D " medium width only. 6D, 7D, SD, 9D, -10D, llD, 12D.